It may not have the pro features, but it takes great pictures at a fantastic price. Canon's Ixus range has been around since the photographic dark ages, and to say each addition carries with it high expectations is quite an understatement. 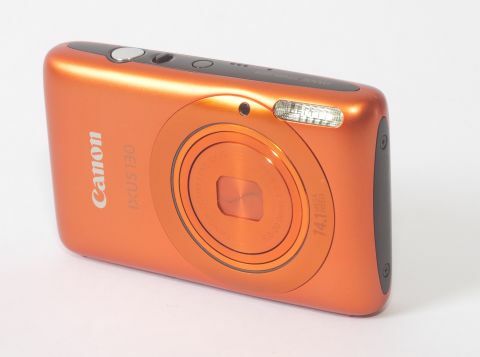 However, the 14.1-megapixel Canon Ixus 130 has the hallmarks of one of the greats. An initially striking design, a consumer-friendly high megapixel count, and a 2.7-inch LCD on the back all combine to make this a camera that should tempt just about anyone in the market for an uncomplicated, fire-and-forget snapper. We struggle to think of an Ixus from the last few years that hasn't ticked the 'gorgeous' box, and the Ixus 130 is a proud continuation of the line. It's unfussy, but the tapered corners, rounded edges, and metallic finish all make this a real head-turner. It's small as well – 93mm wide and 18mm deep – which means it's a perfect trouser-pocket size. The compact dimensions necessarily mean there's a compromise on screen size. Canon's two options with such a small camera are to use a smaller screen, or lose the buttons on the back of the camera and put in a 3-inch touchscreen. Canon has opted for a 2.7-inch, 230,000-pixel LCD, and we reckon it's done the right thing – we've not yet seen a camera touchscreen we've loved. The screen itself is everything a camera screen should be: bright and sharp, and visible outdoors. Crucially, it leaves space for a decent assortment of buttons, such as the four-way D-pad, which doubles as four shortcut keys to features such as the flash and self-timer. There's also a three-position physical switch. Auto mode disables most of the options in the menu, wresting control from the photographer and enabling the Ixus 130 to make its own decisions, while there's also a semi-automatic mode. There's no way to choose your own shutter speed or aperture, which isn't surprising on a camera costing under £150, but you can at least set exposure compensation, manual white balance, and your own ISO. Canon includes some interesting additional modes. As with the Ixus 300HS, you get tilt-shift and fisheye modes. Of these, the tilt-shift simulator is definitely the most effective, offering a cheap way to get an interesting model-town feel to your shots. It isn't something you'll use every day, but if you ever find yourself at the top of the tall building we suggest making use of it.